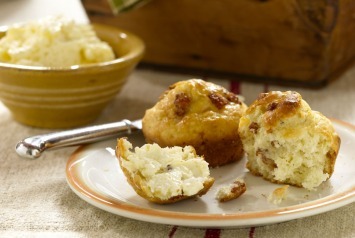 These yummy breakfast muffins are filled with delicious, crispy bacon. Try them served with scrambled eggs or an omelet for breakfast. What a great start to the day that would be! Lightly grease a standard 12-cup muffin pan and place it in the oven to heat. In a large bowl, sift together the flour, baking powder, salt, and sugar. Add the bacon drippings, milk, and eggs and stir to blend. Fold the crumbled bacon into the batter and mix until blended. Spoon the batter into the hot muffin pan. Bake for 15 to 20 minutes, until golden brown. Let cool on a wire rack. In a medium bowl, combine the butter, onion, and garlic powder and blend well. Pack the mixture into a butter mold or place it in a serving container and chill it in the refrigerator before using. The butter will keep for about 4 days in the refrigerator. It can also be heated and served as a sauce over steak, hamburgers, or vegetables. These fantastic muffins would also be good served with a luncheon salad. It is a real treat served with the Sweet Onion Butter, and you just may have to make more of both. Both of these yummy recipes come from a great Southern cookbook called Cider Beans, Wild Greens, and Dandelion Jelly: Recipes from Southern Appalachia by Joan Aller. If you love these breakfast muffins, you will definitely want to have a look at the rest of our muffin recipes. Find them here.